Ireland international James McClean wants a ‘Sea Of Green’ at next year’s World Cup, as both North and South aim for a spot in Russia. 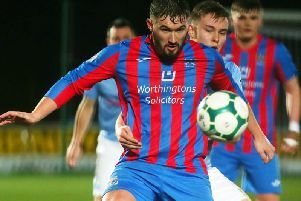 The former Derry City winger, who launched this year’s Hughes Insurance Foyle Cup on Monday night, believes if both Martin O’Neill and Michael O’Neill’s side reached Russia next summer they would bring a lot of noise, just like they did in France last summer. McClean, who recently skipper Ireland in America to celebrate his 50th cap, admits reaching the World Cup would be ‘something very special’. The 28-year-old was speaking to Derry Journal Sports Reporter Kevin McLaughlin at Monday evening’s launch. West Bromwich Albion and Republic of Ireland captain James McClean pictured in Derry last night to launch of the Hughes Insurance Foyle Cup 2017. The Premier League star is pictured with the Derry City Colts squad.